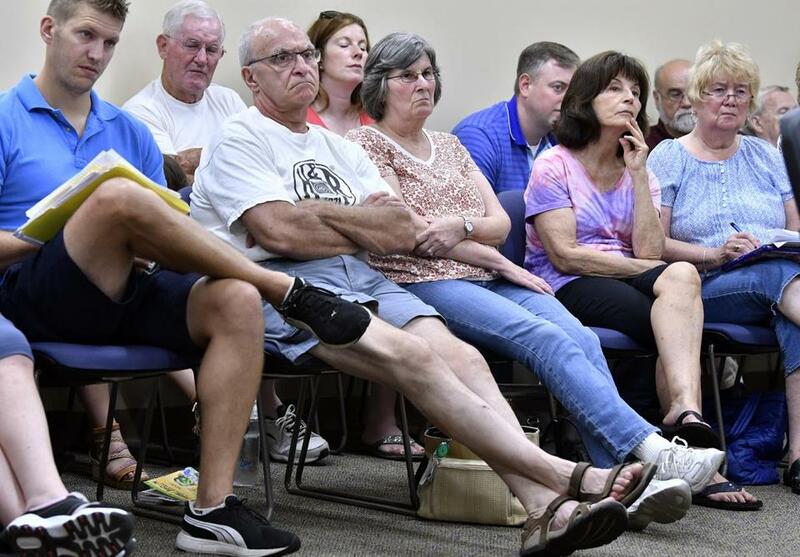 Residents in Millville looked on during a special meeting of the Board of Selectmen on cuts to town services. MILLVILLE — Trash trucks stopped rolling here at the end of June, and more than half of the town’s street lights are going dark. The senior center has shut its doors, and the library has only enough money to open eight hours a week. Welcome to Millville, a bedroom community of about 3,000 residents on the Rhode Island border, where voters last month rejected a $1 million property tax increase. As a result, the town, which has a budget of about $6.2 million, is facing deep service cuts and a budget deficit that could exceed $286,000. The fight over the proposed tax hike exposed deep divides in Millville, a working-class town on the Blackstone River that relies almost exclusively on residential property taxes to pay its bills. The town has just one traffic light and few businesses — the commercial district includes a pub, a pizzeria, and a general store. Pamela Dean Kobetitsch, 63, a retired social worker who has lived in Millville her entire life and supported the tax hike, said she is discouraged by the town’s financial straits. The proposed property tax increase, also known as a Proposition 2½ override, would have added about $914 to this year’s average bill of $4,141 for a single family home, and an additional $100 annually for the five following years, according to Justin Cole, Millville’s finance director. Town leaders initially sought a $1.8 million override, but residents rejected it at a Town Meeting in April. 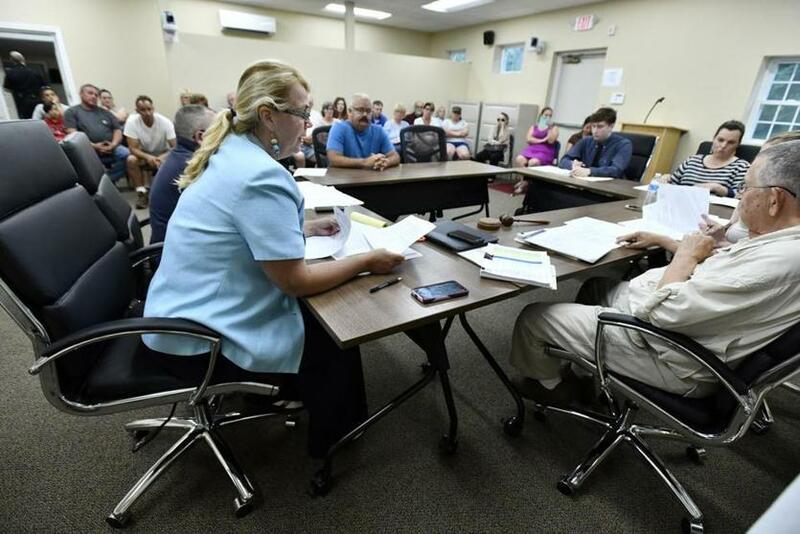 When voters went to the polls on June 19, the $1 million override failed, 589-339, with about 43 percent of the town’s 2,163 registered voters casting ballots, the town said. Despite the deficit and cuts in service that followed, some residents said they preferred sacrificing services to paying higher property tax bills. Millville was among 20 Massachusetts communities that asked voters to raise property taxes for fiscal 2019 beyond the 2.5 percent allowed annually by law, according to the state. The measures passed everywhere but in Millville and Paxton, where voters rejected overrides for some expenses but approved others. Brendan Burke, who teaches at Suffolk University’s Institute for Public Service, said the size of Millville’s override likely intimidated voters. Town Administrator Jennifer Callahan described cuts to town services during a meeting. Town leaders said Millville needed the override to grow its tax base after years of patching the budget with one-time fixes and rising demands from the regional school system. Options for raising revenue were limited, town officials said, because property values have declined and Millville lacks the water and sewer infrastructure needed to attract commercial development. In 2016, Millville had a median household income of $91,250, $20,000 higher than the state median, census figures show. But real estate prices aren’t as strong. In May, the median sale price of a single-family home was $250,000 compared with the state median price of $365,100, according to The Warren Group. “The economy’s good overall but it’s not good in certain areas and costs continue to go up,” said Bernard Lynch, a municipal consultant and former Lowell city manager. A committee known as Millville Citizens Against the Override led the effort to defeat the tax hike plan, raising more than $2,000 to spread their message. The group claimed that town leaders couldn’t explain how they planned to protect Millville from future tax increases if the override was approved; that the budget process was shrouded in secrecy; and that town leaders wouldn’t consider alternatives to raising taxes. The group also said the override would cost taxpayers more than town leaders estimated. Town leaders vigorously denied those claims and accused the anti-override group of spreading misinformation. Millville officials said they tried to balance the budget by scaling back services, renegotiating contracts, and securing more than $1.5 million in grants, but came up short. “The people that were opposed to the override really don’t understand municipal government and what needs to be done to bring a balanced budget to Town Meeting,” said Joe Rapoza, chairman of the Board of Selectmen. By the end of the summer, Millville’s deficit could worsen. The regional school system is seeking an additional $39,632 from the town and the funding will be voted on at a Town Meeting during which residents of Millville and Blackstone will be allowed to vote. The town has already set aside just under $2.9 million for the school district, a 2 percent boost over last year. State Senator Ryan Fattman, whose district includes Millville, said he expects to secure state aid to help reopen the senior center, turn on some of the darkened street lights, and pay for other services. In the meantime, residents have spent the last few weeks securing private trash haulers, waiting to hear whether the town will cut more services, and trying to find ways to help the town institutions they treasure. Nine-year-old Clover Maloney said she sold lemonade for two days, raising more than $150, which she donated to the library. Jackie Lima, a former selectwoman who opposed the override, said she is now president of Friends of the Millville Library and is researching fund-raising options. Municipal officials haven’t revealed their plans for closing the deficit. Dean Kobetitsch, the former social worker who is a member of the Council on Aging, recalled how in 2016, Millville gathered to celebrate its 100th anniversary. The mood in town was so different then, she said. Laura Crimaldi can be reached at laura.crimaldi@globe.com.